Galway Cycling Campaign (GCC) are calling on all cyclists to join them in their mission to get Galway cycling, and are launching a fresh membership drive from April 3rd to April 6th 2018. 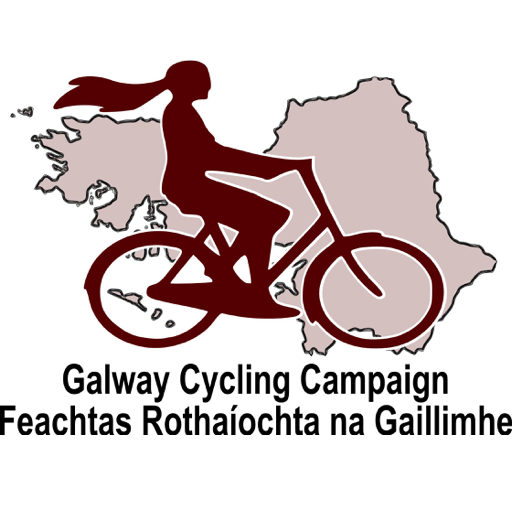 The GCC are calling on cyclists and everyone who wants Galway as a place where people can travel easily, safely and enjoyably by bicycle to sign up. The GCC is an independent, membership-driven organisation made up of dedicated volunteers who advocate for all road users, including pedestrians, families, people with disabilities and public transport users. GCC, the voice of cycling in Galway since 1998, have just launched an online membership facility to make it easy for people to join. It costs just €10 for waged annual membership and €5 for unwaged annual membership. People can sign up either as active members or as supporters. “We are very keen to sign people up as supporters. They may not have time to volunteer, but by becoming a supporter they help us give cyclists a louder voice, and add weight to our campaigns. They cheer us on from the wings, giving us a mandate. Of course we want active members too,” added Mairéad. Newly signed up members and those interested in joining are especially welcome to attend our social which is taking place in a city centre pub on Friday April 6th at 7pm. To book your place please email mairead@galwaycycling.org. 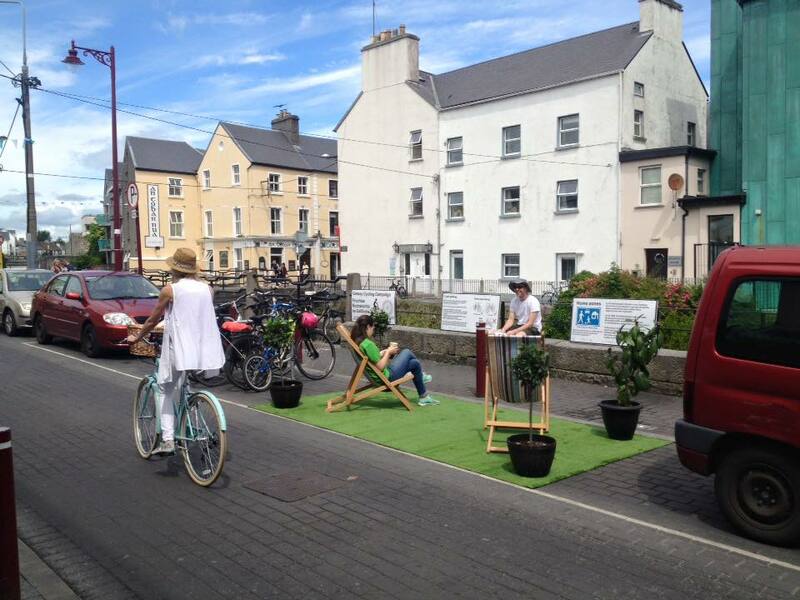 We plan to keep a list on this webpage of all Galway Cycling Campaign’s recent submissions. In the meantime, all recent submissions are available under the relevant press release on our Press Releases page. The Galway Cycling Campaign is supporting concerns expressed this week that motorway proposals associated with the National Planning Framework will damage regional development and hurt regional communities. Several news outlets reported this week that Professor of Economics at DCU, Dr Edgar Morgenroth, is advising that proposals for a €850 million Limerick – Cork motorway would undermine the proper growth of “second tier” cities in Ireland. In Galway, there is a view on the ground that the recently opened Gort to Tuam motorway has actually made traffic congestion worse. Over the summer the Galway Cycling Campaign expressed concern about the impact of motorway projects in a submission to the Citizens Assembly consultation on Climate Change. Referring to “the great Irish motorway mistake” the Campaign submission pointed out how the Netherlands, Denmark or Germany had “unravelled” roads so arterial through-traffic is separated from local traffic. This is how these countries got the space for cycle facilities and improved walking and cycling conditions. Roads are not just treated as systems for catering for cars. Instead they have a range of potential functions and are managed accordingly. Most important is to keep HGVs away from roads used by cyclists and walkers, particularly children. For towns and villages on through-routes there is a need for complete town bypasses or ring roads. This is combined with systems to keep out motor traffic having no business in the area. At one time this was national policy. The 1998 Irish Roads Needs Study recommended a concentration on town bypasses, upgrading existing links, and classifying roads according to function. If Ireland had followed this policy we would have had a good basis on which to promote walking, cycling and public transport in our towns. Instead what happened was a motorway programme was adopted against best advice both then and now. Scarce resources have been diverted into new motorways at the expense of quality of life for local communities. This has been an enormous mistake. It is a travesty that over half a billion euro has been spent on the M17/M18 motorway in Galway while places like Claregalway, Clarinbridge/Kilcolgan and Moycullen are left without bypasses and are still poisoned by traffic that has no business being there. For a fraction of the money spent on an M17/M18 motorway, it would have been far more effective if bypasses for Claregalway, Clarinbridge and Kilcolgan were built instead of the M17/M18. The proposed M20 will lead to a failure of the National Planning Framework’s efforts to grow the cities of Cork and Limerick as distributed sprawl will be encouraged. Among towns along the route, such as Mallow and Charleville, ring roads will still be needed for sustainable development. Building the bypasses now would fix many of the problems that the M20 is supposed to fix. The Galway Cycling Campaign believe that the opening of the M17/M18 has already hampered the growth prospects of Galway city under the NPF and has not removed the through-traffic in villages like Claregalway and Clarinbridge. It is important to note that Galway City is not a candidate for a bypass since Galway clearly does not have a problem with through traffic. Galway is overloaded by car-traffic arriving at Galway City and by internal car traffic created by a poorly managed road system that is hostile to walking, cycling and public transport. There are two MPDL proposals relating to cycling before the Oireachtas at the moment. The bills follow a template established in other countries that specifies 1m as a minimum passing distance where the speed limit is 50km/h or lower and a passing distance of 1.5m where higher speed limits apply. 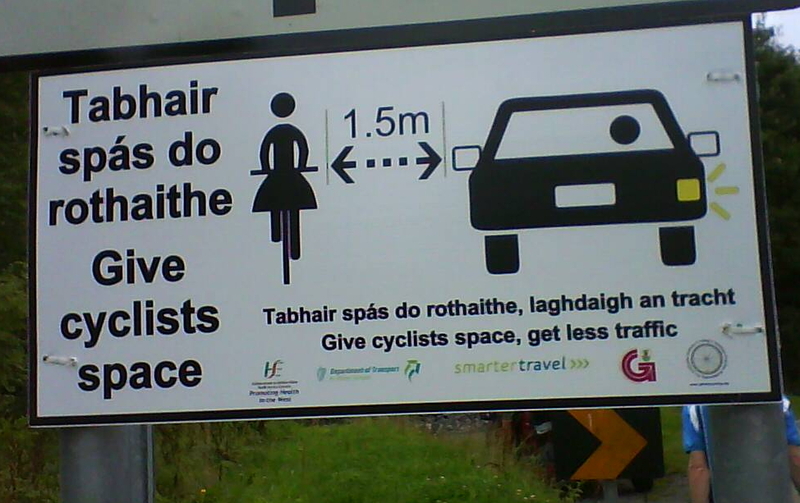 Road Traffic (Minimum Passing Distance of Cyclists) Bill 2017: A private members bill proposed by government ministers Ciarán Cannon, FG Minister of State for the Diaspora and International Development and Regina Doherty, FG Minister for Employment Affairs and Social Protection. This bill received all-party approval at its First Stage reading in the Dáil. The Road Traffic (Amendment Bill) 2017 A government bill to increase the penalties for drivers with alcohol levels of between 50mg and 80mg per 100ml of blood. An amendment to this bill by Fianna Fáil also provides for a Minimum Passing Distance of cyclists by drivers of motor vehicles. Unfortunately, the proposals have been met with much ill-informed speculation. Spurious concerns have been raised with regards to difficulties with enforcement. One answer to this is that traffic laws do not have to be “enforceable” to have an important effect. We discuss the general obligation regarding speed (Article 7) which stipulates that drivers should not drive faster than their ablity to stop within the visible space in front of them. Some contributors have tried to frame the discussion in terms of special clothing such as polystyrene foam cycling helmets and high-visibility clothing. This is seen as an attempt to dilute the obligation regarding speed and as an attempt to excuse dangerous driving. The other issue with enforcement is that it is entirely possible and police forces around the world are doing it. Questions have also arisen with regards to how this law might work with regard to existing traffic legislation and particular Irish road features. We explore the position of stakeholders such as the Department of Transport Tourism and Sport by examining the recent controversy over slow zone signage. In other countries people who walk are also protected by minimum passing distance laws. We explore this and also the failure of the Irish state to provide formal duties of care towards vulnerable road users by drivers. We compare and contrast the treatment of child safety by Irish state actors with the treatment of the issue elsewhere. In Ireland state actors seem focused on making small children responsible for risks created by adults. Elsewhere adults are expected to modify their behaviour in the presence of children. The difficulties thrown up by the intervention of Robert Troy TD are explored. It is hard to square Mr. Troy’s intervention with some of his previous statements that are hostile to cycling. In particular Mr. Troy has called for normal cycling in ordinary clothes to be criminalised. Finally we deal with the issue of Australia. Some contributors have tried to cite Australia as an example to follow. This is clearly not acceptable in the light of cycling-hostile policies found in Australia – particularly their cycle-helmet laws. Australia’s cycle helmet laws are viewed as a public health disaster and, based on Australia’s experience, helmet laws are strenuously opposed by cyclists in Europe and elsewhere. Overall the MPDL proposals are welcome. However, there is real cause for concern that there might be an attempt to attach the MPDL proposals to a push to criminalise normal walking and cycling by requiring unusual items of clothing such as polystyrene foam cycling helmets or so-called high-visibility clothing. If any attempt like this is made then it should be resisted forcefully. 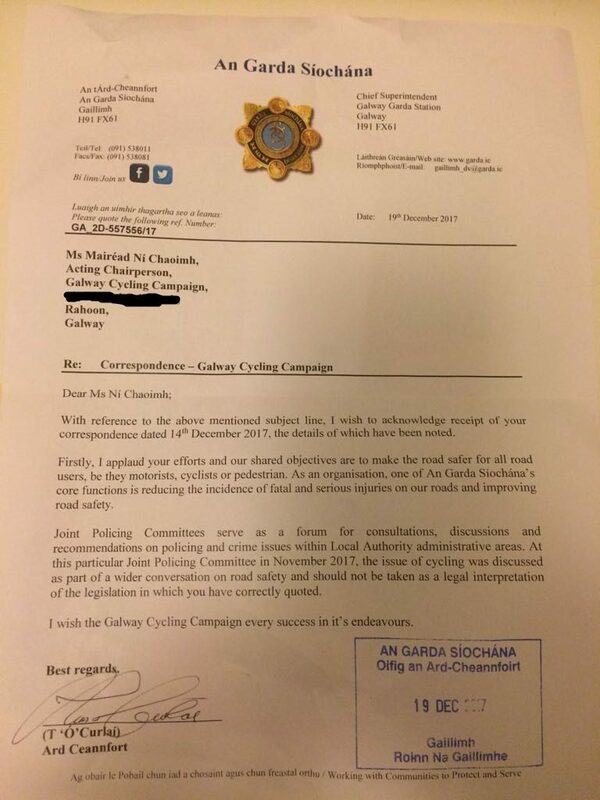 Galway Cycling Campaign (GCC) wrote a letter to Galway’s Chief Superintendent Tom Curley seeking clarification on his recent comments regarding cycling two abreast at a Joint Policing Committee meeting. A newspaper article quoted him as stating that it is unlawful in Ireland for cyclists to cycle side-by-side, that cyclists must cycle in single file. The reported remarks were at variance with the law.